I don't feel like I have a huge amount to hide, nor am I desperate to conceal my imperfections but curiosity got the better of me. My skin tone can be quite uneven particularly under my eyes where my "mask of pregnancy" has decided to stay and also very slight scarring from some old blemishes. And one rosy cheek :-) But as I've mentioned before in a previous blog post, I certainly do not want a freckle joiner thank you very much! 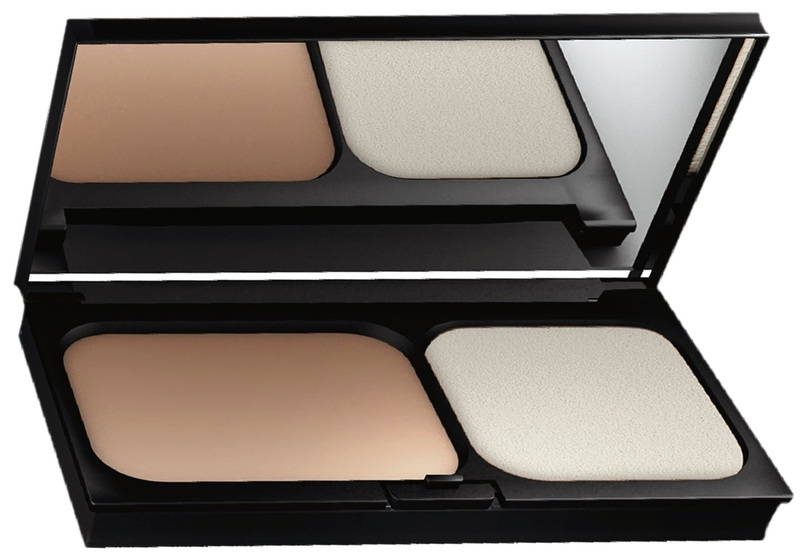 I quite liked the coverage obtained from this compact. In addition, you can dab a little extra on top of any area than needs more coverage if you like, so you don't need a separate concealer. I liked to apply a little of the cream foundation with a sponge to the centre of my face and blend it out towards the edges. I also buffed this out a bit with a brush to soften it a little. This method gives me a natural but medium level of coverage; my freckles were still visible, albeit barely, but any blemishes and dark circles were well hidden, without that heavy mask-like look or feel. This is very buildable up to a more full coverage if you want, and use it with a dampened sponge to net yourself a (very slightly) sheerer finish. Best described as a slightly dewy satin finish, my skin was glowing and radiant due to the light diffusing pearls in the formula, which gave a bit of a glow with no sparkle, just what I want! Although it claims to be suitable for all skin types, I found that this product became quite oily on my t-zone soon after applying. So I think that this will better suit dryer and "normal" skin types. One of this product's boasts is twelve hour wear and durability, but for me, for any of the areas where I had layered product for additional coverage, these started revealing their imperfections maybe four hours or so after application. Also my mascara, which usually wouldn't budge, started blotting under my eyes, where the skin has never been oily before! I discovered that the only way I could make this foundation stay in place for eight hours or more was with the combined forces of a good primer and the Dermablend Setting Powder (which is absolutely glorious, refer back to Siobhan's review here for more info), as my usual setting powder just didn't cut it. I don't agree that it's a long-wear foundation, but I also refer you to the "Best Suited To" section above. It may last longer on you if your skin type is the "right" one. There are five shades available, I'm using "Sand" which was perfect on my Summer skin but possibly a smidgen too dark on my Autumn-into-winter skin. This ships with a sponge, which is perfect for its "normal" medium coverage, but as I've said, you could use a dampened sponge or a dense buffing brush either. A dual fibre brush won't pick up enough product for application (although you could use one to blend-out after if you liked). This is, as you'd expect, a very heavy cream foundation. SPF30, it does flash back so watch it. Skincare-wise it has been tested under dermatological and ophthalmological control so is suitable for sensitive skin, is hypoallergenic and non-comedogenic. This retails at €22.50 and for such a hard working foundation I think this is a pretty decent price. Ok you only get 9.5g of foundation but a little goes an extremely long way. It's not the kind of base that I would use every day, I'm more of a tinted-moisturiser-with-a-dab-of-concealer type of girl but if there was ever a day or occasion where I felt like looking a little more airbrushed and flawless I would very happily use this. For me, personally, it's a little too high coverage to use every day, but it will definitely be making a comeback for any night out that may or may not happen (fellow parents can empathise here). To see more information on the Vichy website click here. So that's it from me for another fortnight! Until next time, whatever the coverage remember you're gorgeous as you are!